Size: 5.9" x 2.9" x 0.6"
The construction and appearance of the original TI-68 - introduced 1989 - was changed in 1991 to reduce manufacturing costs and enhance durability. Most obvious change is the plastic bezel around the display instead the former metal bezel. Dismantling the second generation of the TI-68 reveals no big surprises, the printed circuit board (PCB) was slightly revised but the Toshiba T9948A single-chip calculator circuit is still in use. Another four years later part of the production of the TI-68 was shifted to Malaysia and later to China, compare the differences here. Compare this TI-68 of the second series with the EC-4044 sold by Radio Shack. Missing your TI-68? Missing your TI-68? Think about the TI-30X Pro MultiView introduced in 2010 and its twin TI-36X Pro. 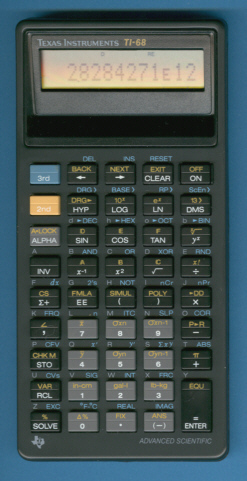 The TI-68 is featured in the Texas Instruments Incorporated sales catalog CL-1233 dated 1994. AOS™ and EOS™ are trademarks of Texas Instruments.